Is the Canada-based gold miner's recent underperformance a buying opportunity? IAMGOLD Corporation (NYSE:IAG) describes itself as a mid-tier gold miner. With a market cap of about $1.5 billion, that's probably a fair description (industry giant Newmont Mining has a market cap of nearly $18 billion). 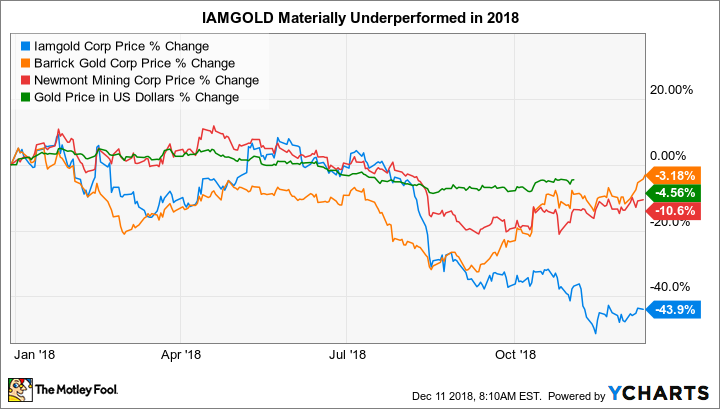 But what's most interesting about IAMGOLD is how badly its stock has performed in 2018, dropping over 40% year to date at the time of this writing. Newmont, for reference, was down around 10%. Is this disparate performance an opportunity to buy IAMGOLD? IAMGOLD probably isn't a name you know unless you track gold miners. It owns four operating mines: one in North America (specifically in its home country of Canada), one in South America, and two in Africa. Its Cote Gold Project in Ontario is its most advanced development effort, but it isn't projected to produce gold until mid to late 2021. A final decision on whether to even build this mine isn't expected to be made until the first half of 2019. IAMGOLD also has four exploration projects located in the Americas and Africa. The gold miner believes it will produce between 850,000 and 900,000 ounces of gold in 2018. That's roughly in line with the 882,000 ounces produced in 2017 (which was up about 8.5% from the 2016 figure). IAMGOLD's cash costs are projected to be between $750 and $800 an ounce, with all-in sustaining costs between $990 and $1070 an ounce. For reference, giant peer Barrick Gold (NYSE:GOLD) is looking for all-in sustaining costs to fall in a range of $765 to $815 per ounce. In other words, IAMGOLD isn't exactly a low-cost producer. In fact, the most interesting thing about IAMGOLD is probably its massive 40% price decline so far in 2018. That's much worse than many of the larger gold miners, but it doesn't necessarily spell a huge opportunity here. 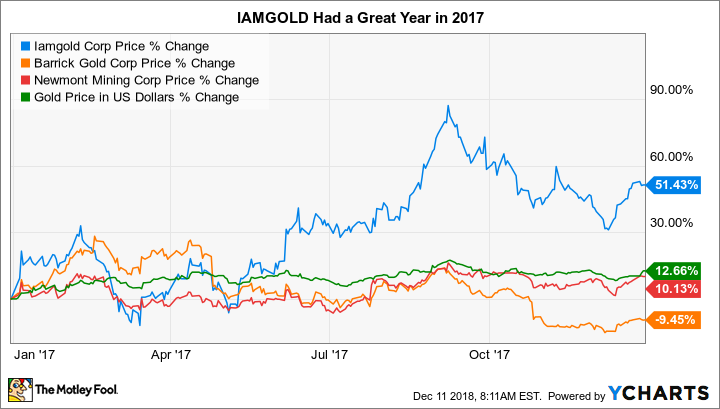 IAMGOLD's pullback in 2018 follows a massive 50% price gain in 2017, a year in which it easily trounced both Newmont and Barrick (up 9% and down 10%, respectively). Gold was up around 12% that year. There was certainly good news in 2017, with the company increasing production about 8.5% and lowering all-in sustaining costs by about 5%. But the real driver was likely the price of gold. With gold prices down 4% or so in 2018, the stock has reversed course. Projections for flat production and all-in sustaining costs, meanwhile, don't help the picture any. And while the company has expansion projects in the works, the really big production-enhancing efforts are still years away from unearthing any gold. So there's not a whole lot to get excited about there, either. It's no wonder that investors' enthusiasm has waned. However, the biggest takeaway right now is really gold. With relatively high costs and little reason to expect a big boost in production for another two to three years, IAMGOLD's stock price is likely to be linked to the price fluctuations of the yellow metal to a high degree. That's because a small movement in gold prices can make a big difference in IAMGOLD's profitability. Gold is currently trading hands around $1,250 an ounce. Assuming IAMGOLD's worst-case estimate of $1,070 per ounce all-in sustaining costs, a very rough estimate is that it would make $180 for every ounce of gold it sold. (There are more costs to consider for the company as a whole that aren't included in all-in sustaining costs.) Barrick, using its worst-case estimate, $815 an ounce all-in sustaining costs, would make $435. But what happens if gold prices change? If gold were to fall 10%, IAMGOLD's profit per ounce would drop to just $55. That would be a massive 70% decline in per-ounce profit. A 10% decline in the price of gold would lower Barrick's per-ounce profit to around $310, which is roughly a 30% decline. The math is similar when gold prices are heading higher. That explains why IAMGOLD is more leveraged to gold price changes than lower-cost competitors. IAMGOLD is not a gold investment for those with weak stomachs. With little to suggest that its operations are going to materially change in the near term, it remains a relatively high-cost miner. That means that gold price changes will likely have an outsize impact on its stock price. If you think gold is going to go through the roof, that leverage might sound enticing, but anyone else would be better off with a lower cost miner like Barrick. Or, better yet, a streaming and royalty company, like Royal Gold, that provides precious metals exposure but uses a vastly different business model that locks in wide margins.